Coloursplash! shine is an innovative Demi-Permanent hair color that shampoos out in 6-8 shampoos. Coloursplash! shine can be used on men, and women both with all shades of hair color, and on natural or treated hair. Now you can enjoy gorgeous hair color all the time, even between visits to the salon. Coloursplash! shine is eco-progressive, and has no ammonia, peroxide, or harsh chemicals. 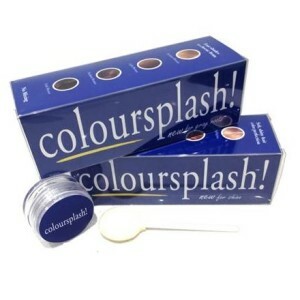 Simply mix with shampoo to activate the real hair color pigments, and enjoy healthy, shiny hair all the time. Sold out in 6 minutes on QVC! Stops Fading Hair Color in 5 mins flat! Made with Real Hair Colour with no harsh chemicals Eliminates dull & drab hair color Keeps your hair color rich and takes the “Fear” out of hair color. Simply mix with water and your shampoo. Safe to use once a week or once a month. No Animal Testing.